Con Cabin: why fix what wasn’t broken? Forgive me. I’ve just turned both Handling and Powertrain settings in McLaren’s 570S to ‘Track’, pointed its nose at the summit of one of our regular stomping grounds, and kicked the loud pedal. And the resultant punch to the spleen I’ve received is truly remarkable, as is the unremitting pull as the speedometer hits 100kph in just over three seconds. 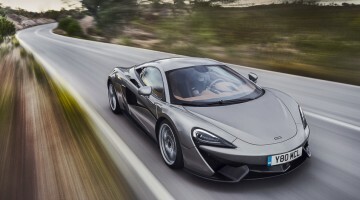 Attached to the 3.8-litre twin-turbo V8 powering McLaren’s ‘baby’ is the company’s established seven-speed SSG automatic gearbox, which delivers rifle-bolt like shifts with every flick of my right wrist. The sensation of speed is felt both in the small of my back and through in my ears as 567bhp is ‘punched’ to the asphalt, the exhaust note rising another semi-octave as it does so. In front of me, aside from the rocky terrain flashing past, the digital speedometer flicks from green to red as we approach the rev limiter. This is supposed to be McLaren’s entry-level model, right? Woking’s answer to the Porsche 911 Turbo, the ‘most attainable yet’, and a modicum less aggressive at the sharp end? You’ll have to forgive my cynicism during our first taste of the 570S on home turf though, since I think someone might be telling porkies. 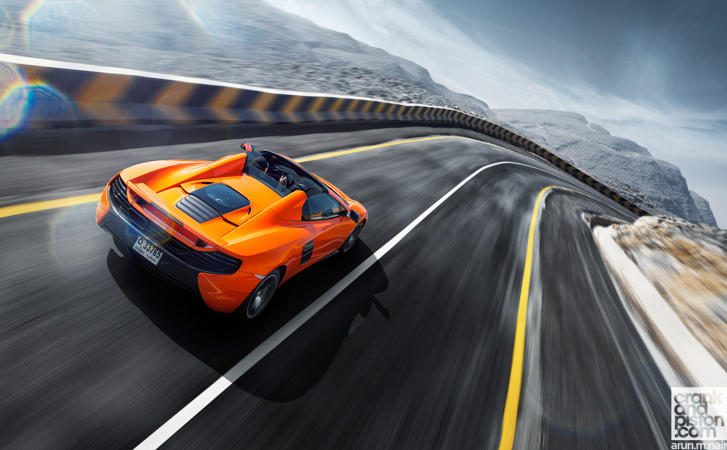 Indeed, dig beneath the surface and you’ll find the same MonoCell II carbon fibre monocoque as found on every McLaren road car since the 12C, plus a ‘slower’ version of the same M838TE-spec V8 capable of a laughable 328kph versus the 650S’ 333kph. Aesthetically, there too lie the Woking ‘tick’ headlights, carbon fibre accented front splitter and dihedral doors we’ve come to expect from Woking. 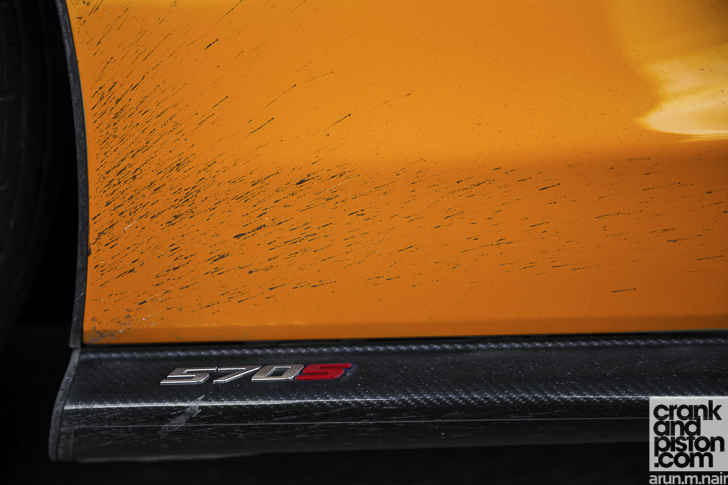 The 570S is also a whopping 150kg lighter than its nearest rivals. So far, so McLaren supercar then. Said MonoCell chassis for instance boasts the same stiffness and rigidity but is connected not with the ‘pioneering’ (nee ‘complicated’) ProActive Chassis Control as both the 650S and the 675LT in the higher tier Super Series, but with a newly developed setup using double wishbones, designed to iron out the bumps. Despite being McLaren’s baby, the 570S is ironically both wider and longer than the 650S to produce more cabin space, while the dihedral doors now arc higher and further forwards whilst opening to make access over that shrunken door sill even easier. There’s even a glovebox (McLaren’s first) and cupholders, garish accessories Woking has not yet had the cheek to add to their supercars. 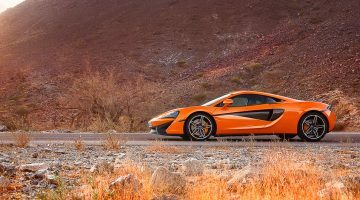 Don’t be fooled though, for in eyeballing the new 911 Turbo, Mercedes-AMG GT, and Audi R8 among others, McLaren has – necessarily – not let ‘day-to-day usability’ focus draw its eye from performance. I’ll admit the rather awkward overall look is not exactly my cup o’ Darjeeling, but the ‘floating tendons’ on the door panels not only look the bees knee joints but also draw air more efficiently to both the rear brakes and the engine bay mounted behind the drivers seat. Both the front splitter and rear diffuser are derived from the McLaren Formula 1 team work in tandem with an integrated rear spoiler optimum downforce, reduce drag, and aid cornering agility. Ably too, it must be said. In Sport, it’s (once again) much as we’ve come to expect from McLaren, feedback through the hydraulically assisted steering rack both direct and crisp with a natural weight than feels so intuitive. Stopping power through the carbon ceramic discs is eye-watering, while the grip at the front end is monumental, making me wonder if anyone at McLaren has ever even heard the word ‘understeer’. The rear wheels meanwhile lock onto line obediently to produce a truly stunning mid-corner neutrality, allowing me to get back on the power again early once we’re through the apex. 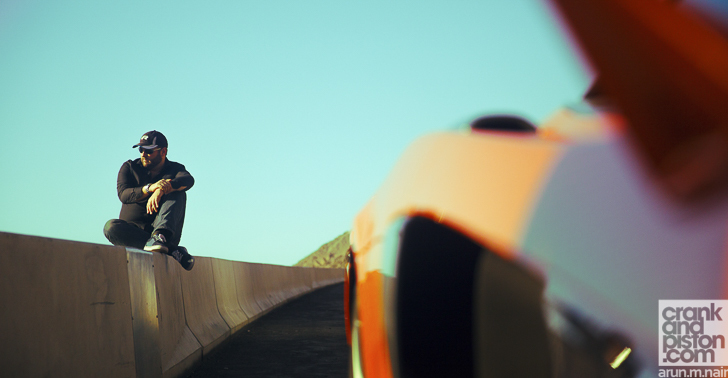 Truly supercar performance from a – supposed – sports car. In Track mode, there’s a difference. The analogue speedometer rolls aside in place of a digital readout complete with rev counter. Front end bite under turn in remains much the same, as does that textured feeling through the steering. And while the low centre of gravity means the balance is still impressive, the rear wheels – now free of their ESC shackles – come alive. 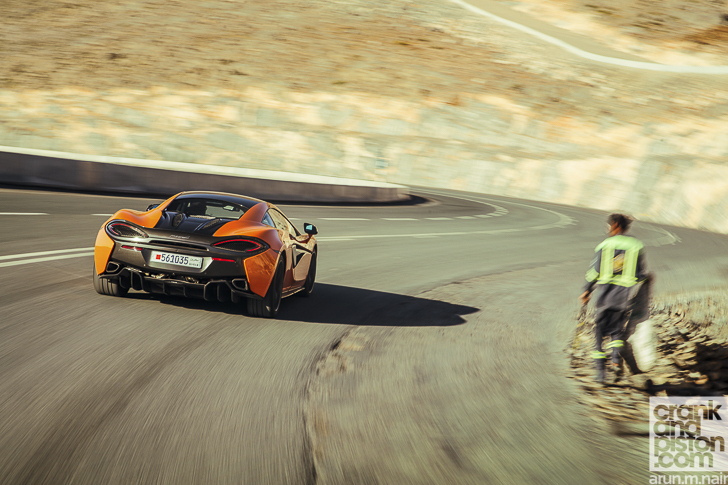 You couldn’t really call it a ‘snap’ – this is still a McLaren, after all – since the step out is so progressive, it’s easily catchable with just a hint of play on the throttle. 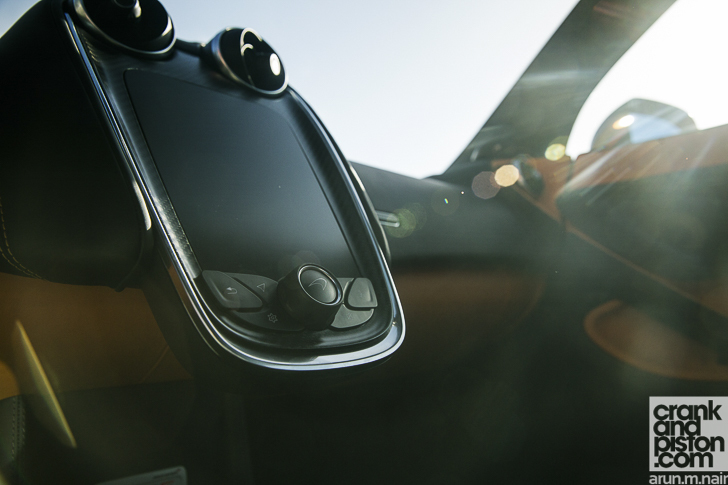 But it’s an aggression, even despite the imposing looks I’d not expected from a McLaren with a cupholder. And it’s mesmerising, though perhaps not for the reason you might think. Chucking any old McLaren (sorry Woking) at the scenery without stacking it is simple enough with the sheer amount of electronic assistance at your disposal. With the 570S though, there’s a sense that ‘the limit’ – through less power or a more refined ferocity than its bigger sisters – is much closer. Or should I say, attainable. Suddenly the temptation is there to push the acceleration harder, the braking later, and the front end more brutally than is expected of a McLaren, in the naïve hope of finding the edge. It’s tempting, though you might not want to push your luck too far. So then, the 570S is fast, agile, engaging and it’s a McLaren. Cue the credits and pithy closing statement? Not quite, for its when we consider the day-to-day usability that a few issues arise. I’m also sorry to see the disappearance of McLaren’s elegant cabin design, in my opinion the most stylish on the market today. Granted the new ‘floating’ centre console makes access to the storage bin behind it much easier, and I will admit the ‘tick’ design around the speaker on the door panel is a nice touch. But I wonder whether this much carbon fibre detailing is necessary. Oh, and the Volcano Orange seatbelts? All well and good if you’re Lamborghini or AMG, but come on McLaren. You’re better than that…. I’m not going to waste your time by speculating the 570S’ credibility though. Even with the occasional niggle, this is still a truly spectacular performance machine, regardless of ‘supercar’ or ‘sports car’ stature, since frankly it poses a tough challenge for any newcomers. The power delivery is no less aggressive than we expect McLaren, the handling no less poised and the balance is beyond fault. Anyone with Porsche 911-money burning a hole in their Armani suit jacket will not feel short-changed by the 570S, even despite a ride comfort and cabin civility that may not quite hit the bulls eye for McLaren’s most attainable model to date.